When you have duplicates of the same Hero, you can combine them to create a stronger Hero. 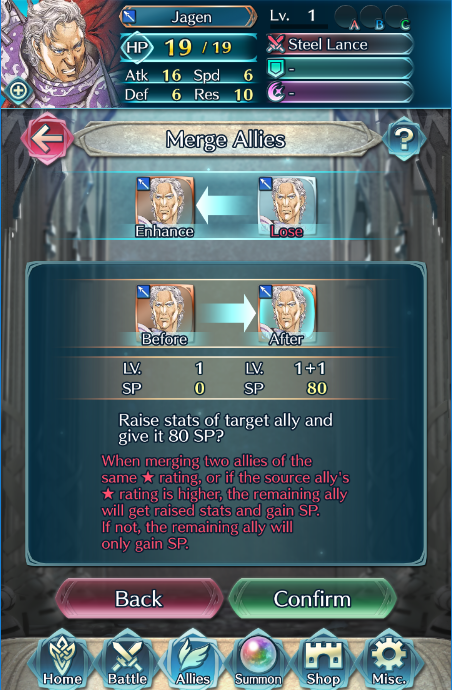 The ability to combine heroes is accessed via the Allies menu – Advanced Growth – Merge Allies. First you need to select a copy of the Hero to enhance. To do so, you must tap the empty “Enhance” box and then tap a Hero (or the other way round). This Hero will be referred to as the “remaining Hero”, because only they will remain after the fusion. Next, you need to select a copy of the Hero that will be sacrificed. Likewise, tap the empty “Lose” box and then tap a Hero (or the other way round). This Hero is the “source Hero” and will completely vanish after the fusion. Note: If a Hero has been favourited (as indicated by the heart icon), you cannot sacrifice them. You can remove a Hero from your favourites via their detailed profile screen. The results of the fusion depends on the rarity (as indicated by the number of stars) of the remaining Hero and the source Hero. If the rarity of the source Hero is equal to or higher than the remaining Hero’s rarity, the remaining Hero will receive a boost to their stats. This boost is also reflected by a +N affixed to the Hero’s Level, where N indicates the number of fusions. 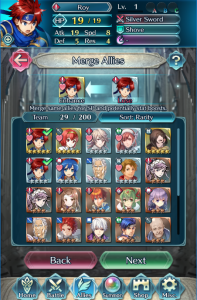 Note: Should you increase a Hero’s rarity, they will lose all of their Level+N stat boosts. As such, we recommend only performing this kind of fusion with 5 Star Heroes. Or Heroes you plan to keep at a specific rarity. 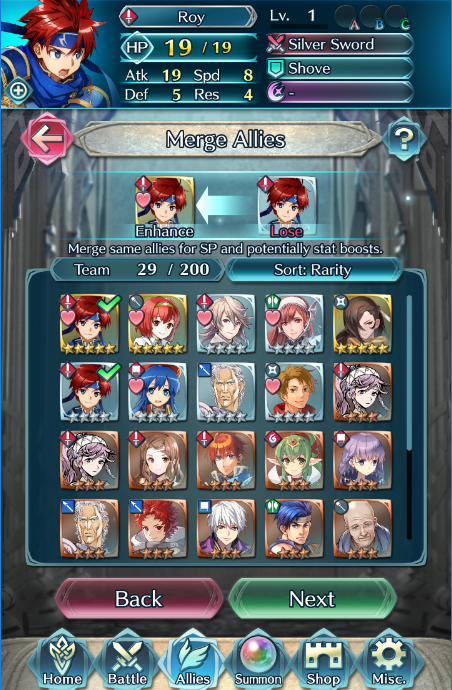 Additionally, irrespective of the remaining Hero’s rarity, the remaining Hero will gain SP dependent on the source Hero’s rarity.